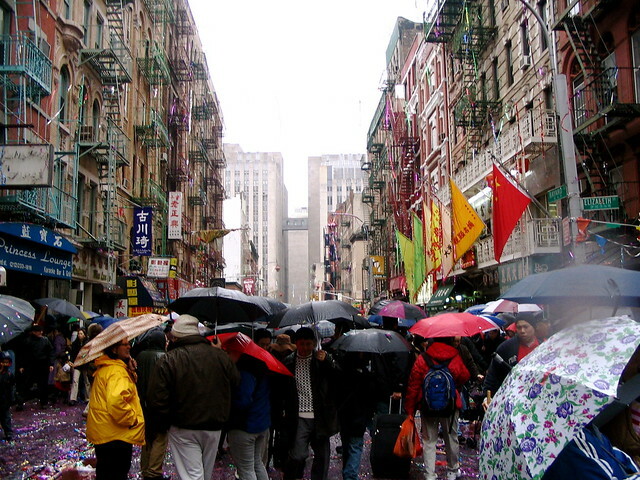 Chinese New Year in Chinatown, 2006. The paper rockets exploded and the streamers coated the wrought iron railings. A dragon head bobbled down the street attended by a great drum. The rain poured from the sky, and the streets and sidewalks were full of umbrellas and vendors with umbrellas to sell, 3 for $5. It was Chinese New Year in Chinatown. Elsie felt like it was a transformative cultural experience, a fresh excitement in the general excitement of New York. “I hope,” Elsie said. “This is my year, the year it will all change.” She’d been in the city for a month. So far, she had spent more than she had, walked through gray snow, and tried not to smell aged trash. Elsie waved the thought away. The rain was turning to sleet. Elsie jammed her hand back into her pocket. They followed the parades. Cynthia, smiling, recited facts about various parts of the festival. Elsie mostly didn’t listen. The street was a mess with paper and debris. But a shiny red envelope caught Elsie’s eye. She picked it up. This entry was posted in Methods, writing and tagged chinatown, chinese new year, holiday, methods, motivation, new york, timed writing, Writing, writing prompt, writing prompts on February 19, 2015 by Vironevaeh.